Android offers many options for developers to create ingenious and useful tools for people with accessibility problems. This is one of the strengths of Andorid OS, and there are numerous options to bring technology to visually impaired people. To adjust the accessibility on our Android device is very simple, and it only requires a few steps. One of the most interesting tools are text readers, which translate written text to speech. With that tool, we can recognize the apps present on the screen, and read emails or web pages. There are several apps that can do this function, known by the acronym TTS, although the best known and the best valued by users is IVONA. IVONA offers a lot of possibilities thanks to its wide range of voices in 22 languages and almost 50 different voices to choose from. With IVONA we can browse our smartphone, receive instructions from Google Maps via voice commands, read emails or even listen to a complete e-book. IVONA not only has an Android app, but it also has the PC version and participates with other innovative projects as well. 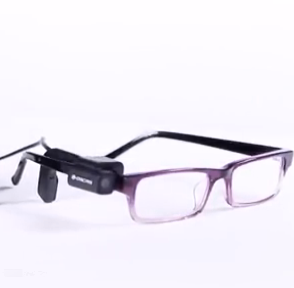 An example of this is its collaboration with ORCAM, an Israeli company that created a device that can be adapted to a conventional eyeglass and helps with the identification of the details of our surroundings. OrCam is able to recognize faces, objects and places; it can identify bus numbers and distinguish traffic lights, greatly improving the lives of people with severe problems of vision. The text that identifies the camera is translated to voice using the IVONA software and transmitted directly to the ear of the user. The OrCam idea is to make easier the life of its user, so it has to be as much autonomous as possible. It automatically recognizes the traffic lights and the faces of the people we knew when we find them on the street. However, the device would not be much useful if it were not capable of learning. To be functional, as for example in the ability to recognize the familiar faces of people, it needs to learn new faces, something what we can do easily with a simple gesture to the wrist. Another of its strengths is the ability to read texts by simply pointing them. If we are looking at a newspaper, a restaurant menu, or at the screen of our computer, it automatically starts to read its contents aloud. 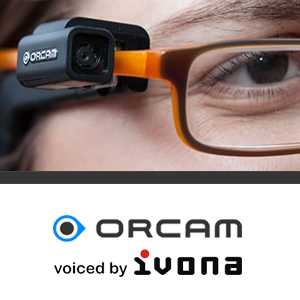 The OrCam will go on sale for about $ 2500, and it will be sold through their website. More information at IVONA and OrCam.